Looking like fine silk, this ivory or cream color satin dress shirt and tie set by Daniel Ellissa will make your special event quite a memorable one. Mens satin dress shirts are a great alternative to your standard pleated tuxedo shirt and they are quite popular with all types of entertainers on stage and music groups as well. 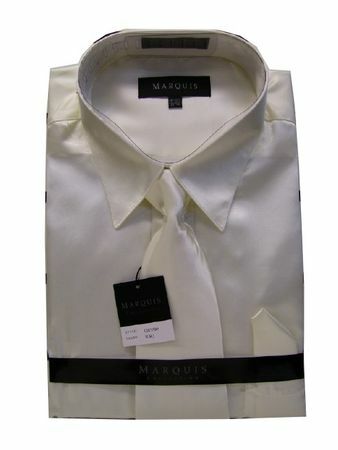 This ivory color silk style satin dress shirt and tie combination comes exactly as shown with the matching tie and hanky. Just add attitude and you're all set. Fabric is Poly satin. If you're shopping online for dance shirts for men, a satin dress shirt will more than likely be the type of shirt for dance that you're looking for at a reasonable price.